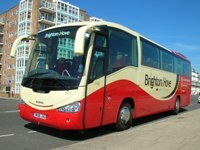 Brighton & Hove’s unique M25 tour took to the road on Thursday and was hailed a great success. The 117-mile journey around Greater London cost the 38 paying customers £15 each, and took them clockwise round the road from junction 6 at Godstone in Surrey, after being picked up from Worthing and Brighton. The trip, which started at 1130hrs, took four hours to complete. Roger French, MD of Brighton & Hove (B&H), told CBW: “The first official tour was a great success. We have had fantastic feedback from the people who were onboard. The media has taken to the story quite considerably, with coverage from Sky, BBC, ITV, 5Live and Radio 2, to name but a few. Roger was also keen to praise Nigel Pullen, the tour guide who provided passengers with facts and figures throughout the journey with his deadpan comedic style. Roger French, the popular Managing Director of Brighton and Hove Bus and Coach Company, is to retire next year after overseeing the operation of buses in the south coast city for 30 years. Norman Baker MP launched one of Brighton & Hove’s latest Wrightbodied Volvo B5L Hybrid buses on Friday (November 16).